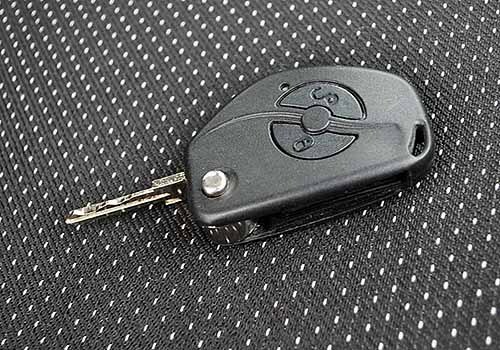 The keys remote control door lock for Lada Kalina similarly programmed keys to the Lada Prior, the Field and the SUV UAZ Patriot. With the exception of the master key is red, no instruments are required. Remote control door locks, alarms, glass, and trunk immobilizer is mounted on the blade of the ignition key and is designed to work as radio and transportarea channel. Safety measures in handling the same as with other electronic devices: protect from mechanical damage, from moisture, from heat, hypothermia, etc. Before you operate the remote control, activate it (will train), using a master key to the immobilizer. It differs from other keys by the color red. Once activated, the console can function as a coded key Immobiliser and remove the ban to start the engine. The system permits the activation and simultaneous work with two remote controls. Before you start training, make sure the gas tank is at least 10 l of fuel. Otherwise you risk to get lost in the sound signals on the car. Close all doors, turn on the ignition, the master key and wait at least 6 seconds. Then turn off the ignition. This should start rapidly flashing indicator in the block of control lamps and continue to do so throughout the entire learning procedure. If the blinking stops, it means you made a mistake, went beyond the allotted time or there's a malfunction. Remove master key from ignition. Then before the expiry of 6 seconds, insert the key, castle learning and turn them in the ignition. The immobilizer must submit three beeps, and after 6 seconds another two. Trained remove the key from the ignition. If training has not occurred, repeat the procedure again, being careful not to go beyond the 6-second interval, or look in the immobilizer fault. Learning procedure apply in the following cases: activation new key, erasing the old remote, change the password of the system when selling a car, you change the immobilizer or controller. Teach only the new keys, never before not been used for this procedure, or those who have already studied with the master key. By the same master key, try not to use it. Keep it in a safe place.